Master Cylinders and Power Cylinders are used on a wide variety of vehicles and equipment in the agricultural, construction, material handling, mining, and other industries. Master Cylinders are single piston, straight-bore type with a return spring, and are available with or without an integral reservoir. Power Cylinders incorporate the advantage of a large piston for fluid volume, and a small piston for high pressure. 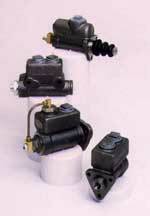 They are available in two basic mounting styles and can be ordered with or without residual check valve.